In this blog we have spent a lot of our time with case studies drawn from the “Big 4” large-scale deliberately adversarial institutions: markets, electoral politics, sports, and the justice system. But some of the most illuminating analyses are sparked by adversarial activities in other realms, or in peculiar corners of the Big 4. Expect this list to grow over the coming weeks. If you have suggestions for other adversarial realms we should be working on, please let us know in the comments section, below. A deservedly viral proposal for the American Philosophical Association. 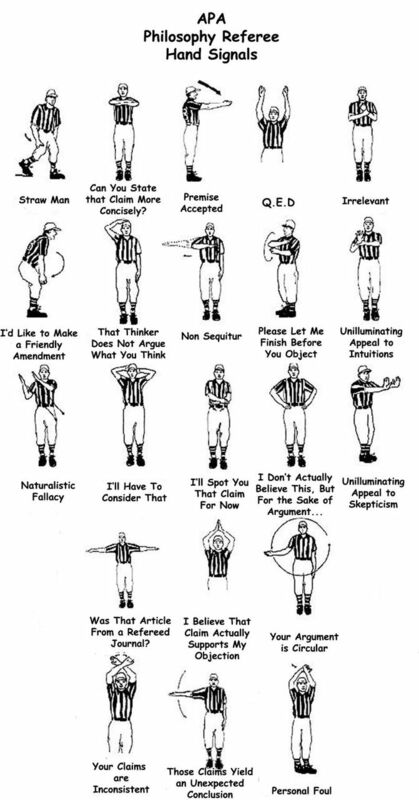 My favorite is the middle signal in the second-last row. It is the signal for a “safety” in American football — when a team is unable to carry the ball out of its own endzone and concedes two points; like an own-goal in soccer. Race-to-the bottom watch: competitive babies? 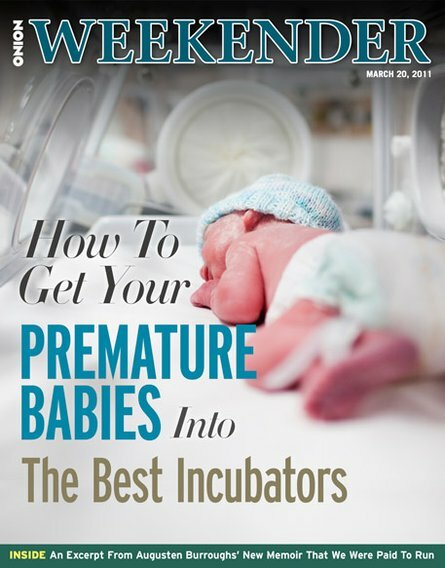 This spoof cover from the Onion advertising “How to get your premature babies into the best incubators” presents a comical account of parents anxious to give their children a leg up on the competition. The humor of the cover, however—like the comedic value of most good jokes—comes not from its outlandishness but from the close-to-home truth it conveys. 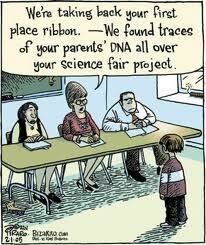 “If all of this makes kids and young families happier than they were 20 years ago, terrific. But I don’t think that’s what is going on. As far as I can tell, sports have three purposes: To get exercise, to have fun or to get your kid into college, earn a scholarship, turn professional and become rich and famous. The evolution in youth sports appears to be mostly about the third one. Here’s the problem with that: The number of scholarships (and college athletes) is more or less fixed. So is the number of professional athletes and the total amount of money to be won on the PGA Tour. Perhaps the most problematic aspect of a race to the bottom is the difficulty or impossibility of escaping it. If parents prevent their children from starting competitive sports until they are ten years old or even older, then those kids will have to live with a competitive disadvantage unless all the other parents make this same decision. On the other hand, pushing kids into sports and preschools earlier and earlier degenerates into a race to the bottom in which everybody comes out worse off. It remains to be seen what mechanisms could prevent this collective action problem. Wheelen points out that little leaguers are operating with fewer regulations that professional athletes. While this lack of regulation used to suffice due to a lack of necessity, it seems increasingly possible that regulations are needed to protect even the youngest of the current generation from plunging into various races to the bottom. Some of the topics of conversation were plucked from my other blog, This Sporting Life, including one on Why the NCAA Tournament is the American Idol of Sports, and What’s Wrong with the Wonderlic Test. Bethany’s post here about what we learn about political ethics from primary elections also got a quote and a shout-out during the interview, and it can be found here. Stay tuned for some of her follow-up thoughts on that topic.